Quiz Party will release across Europe for Wii on July 27th, Nintendo have announced. 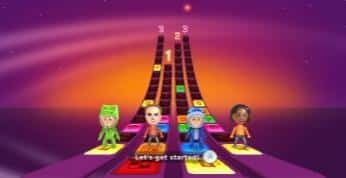 Challenging an unlimited number of players with over 2000 questions that cover a wide variety of fans, each voiced by legendary Quiz Show host Roy Walker, it’s a perfect opportunity to put your general knowledge to the test! History, Geography, Nature, Sport, TV and Films are just a selection of topics covered, with the game pitting between two to four teams head-to-head. Once you have formed your team, it’s time to choose your mascot which can either be your own Mii characters or a choice of local mascots. The overall aim of the game to answer questions correctly from within five categories to earn stickers. These include ‘Odd One Out’, challenging you to find the odd one out from within four visual elements and ‘Brainstorm’, where you must pay close attention because your observation, concentration and memory will be tested. In ‘Blind Test’ you will need a keen ear to listen to the music or sounds and in ‘Multiple Choice’, you will be given four possible answers and only one is correct. Lastly, ‘Time’s Up’ puts you against the clock, ensure that you don’t fall behind. Quiz Party will launch across Europe for Wii on July 27th.